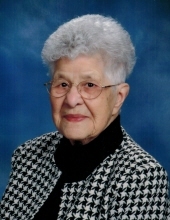 Mary Ann Clairmore, 102, of Schofield, passed away on Monday, Feb. 4, 2019 at Aspirus Hospital. She was born on Sep. 25, 1916, in Merrill, to the late John and Myrtle (King) Wadinski. On June 4, 1938, she was married to Robert J. Clairmore in Waukon, Iowa. Robert passed away on May 23, 1986. Mary Ann worked at D.C. Everest High School. She enjoyed spending time with family and friends, reading, playing cards, sewing, camping, casino trips, traveling, and Friday night fish fry adventures with her brother and granddaughter. The memorial service will be held 11:00 a.m. on Friday, Feb. 15, 2019, at Mt. Olive Lutheran Church, 6205 Alderson Street in Weston, with Pastor Lance Hoelscher officiating. Burial will be in Pine Grove Cemetery at a later date. Visitation will be at the church prior to the service from 9:30 a.m. to 11:00 a.m.
To send flowers or a remembrance gift to the family of Mary Ann Clairmore, please visit our Tribute Store. "Email Address" would like to share the life celebration of Mary Ann Clairmore. Click on the "link" to go to share a favorite memory or leave a condolence message for the family.